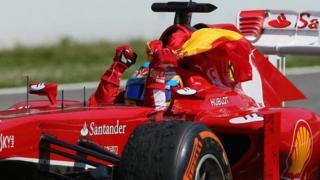 Ferrari's Fernando Alonso wins in front of his home fans as he comfortably wins the 2013 Spanish Grand Prix. Starting fifth on the grid, the Spaniard powered through the field to take the victory, with Lotus's Kimi Raikkonen coming in second. Alonso's team mate Felipe Massa claimed the third spot on the podium.